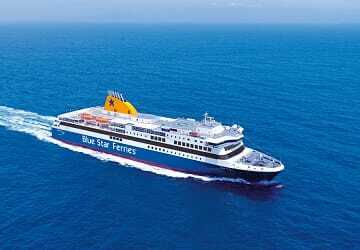 Blue Star Delos ferry is 145 metres long, 23 metres wide and can hold 2400 passengers and 427 vehicles in its garages. Blue Star Delos was built in South Korea in the same shipyard as the Blue Star Patmos part of a 140 Million euro investment by Blue Star Ferries. 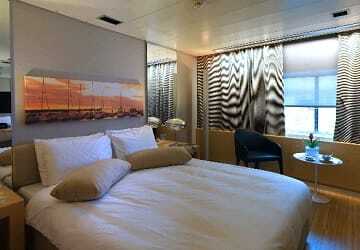 The ship has comfortable public spaces, offering a year round comfortable and luxurious travel. 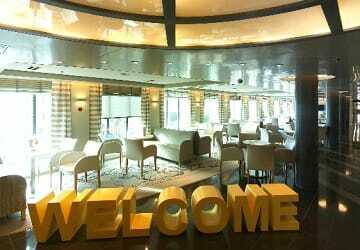 Facilities onboard include, a bar, open deck bar, boutique shop, café, video games room and more. 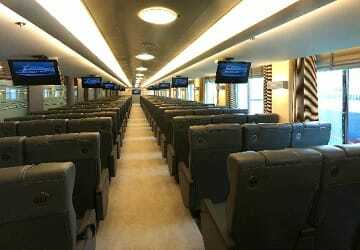 If you don’t require or wish to book a cabin the Blue Star Delos offers comfortable and spacious air type seating. 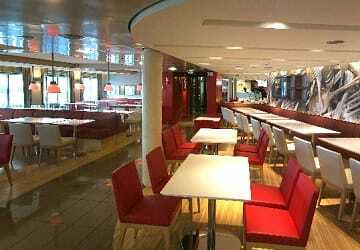 There are two main places onboard the Blue Star Delos where you can purchase food and drink. 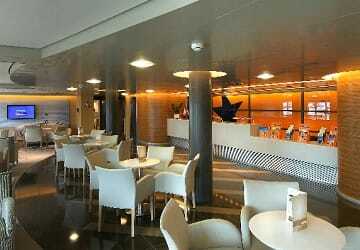 Blue Star Delos main self- service restaurant Goodys offers ‘fast food’ style meals where the idea is for passengers to ‘eat and go’ directly after finishing their meals, the snack bar Flocafe is the ships secondary restaurant and offers a selection of hot and cold snacks such as pastas and chips with Greek meatballs. Wi-Fi access is available in certain areas of the ferry, an ATM machine is onboard for those who need to withdraw money and there is a payphone if you are unable to connect through your mobile and kennels can be booked for your pets at an advanced request. Please Note: Whilst we have taken great care in making our Blue Star Delos guide as accurate as possible, onboard facilities, services and entertainment may vary depending on the date and time of year that you travel, facilities mentioned may change without notification and ferry companies reserve the right to operate vessels other than those mentioned at time of booking without prior notification. I travelled recently on Blue Star Delos - just short trips between Paros and Naxos. 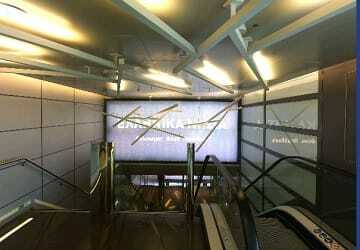 All was good: punctuality, cleanliness, catering, and the staff. But the star of the trip was the Direct Ferries team, who alerted me to impending industrial action which meant a ferry strike on one of the days I was travelling. This prompted me to change my plans and not suffer as a consequence of the strike, otherwise I would have incurred hotel fees for a reservation I couldn't make, etc etc. THANK-YOU Direct Ferries! Really impressed.